don't know why the title is plural, this could end as soon as it starts lol! 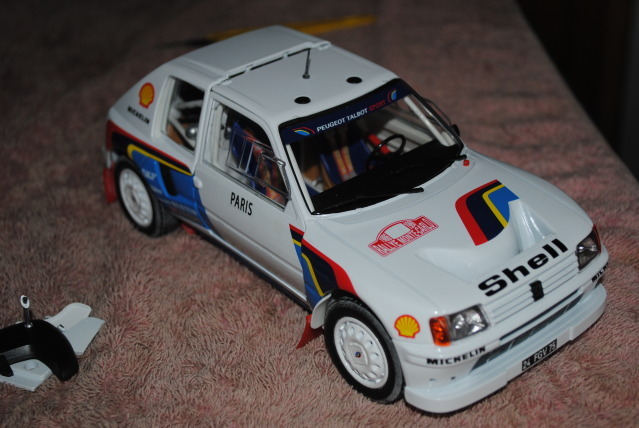 well i thought i'd do something different and start a thread showing my attempt at converting a 1:18 Solido 205 T16 Evo 2 from Monte 1986, into Ari's 1985 Evo 1 version, also from the Monte.......i know this car is available in 1:43 form but not in the big scale, so having bought a spare one, what the heck! 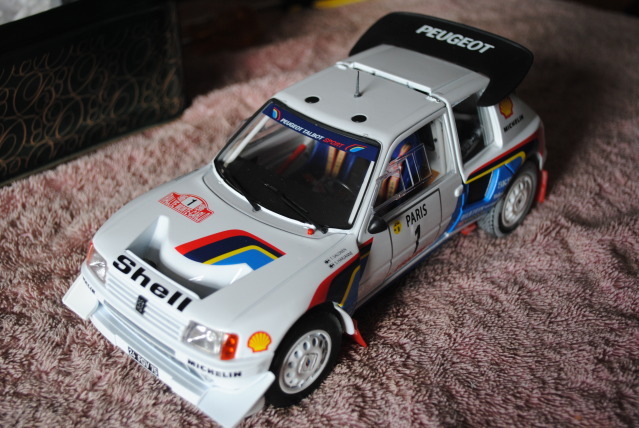 now this might take months or years, i've no expectations, and i know i could have easily changed to his 00 car used in 86, but that would be too easy/sensible lol!! anyway, here's the start of the so-called job, who knows what kind of ba__ix this'l end up, but sure its all good craic!! Your a brave man Billy. No really good luck! i haven't a clue m8 lol!! looking forward to seein all this taken place and shape. Nice one Billy! Just wait till Omer sees it and starts giving you some advice - that Pug will be a Manta next week! can you please stick the original car photos in here as well? Nice project billy. Something different is always good. Milliput and patience is all you need. Get on Billy and why not.....Just take your time mate..it'll come together nicely for ya..
thanks lads for the encouragement, though brian i think milliput, patience, and..........oh yeah thats it, ability!! lol! Fair dues to ya, Billy. Love watching these projects coming together and looking forward to this. ah thanks ted, just don't be looking too close at her m8 as my 'modifications' develop lol!! 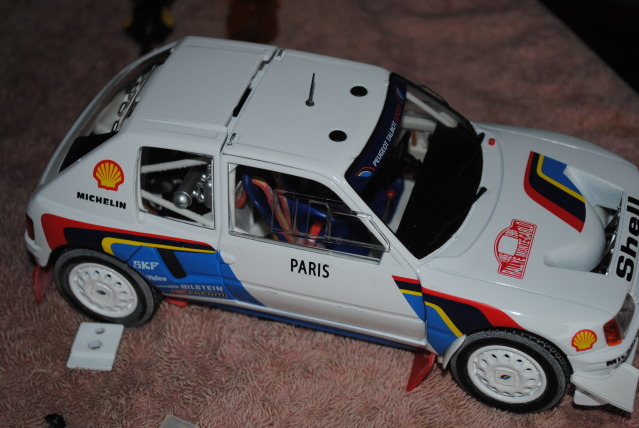 lads, a wee bit of advice please, i have looked at several pix of the 05 car from the monte, and some 1:43 models of the same car...some pix show the roof spoiler as a black solid item attached fully to the top of the hatch, but some other pix show it as more of a low aerofoil, ie attached at each end but raised away from the roof along the centre, plus its white! Billy, most of the photos of the '85 Monte car show the rear spoiler to be white with a black leading edge. Not a gap but almost looks to be a rubber infill. There is one photo which shows a black spoiler. Remember the rear bodywork comes off so if Ari had damaged the rear, they would replace it. 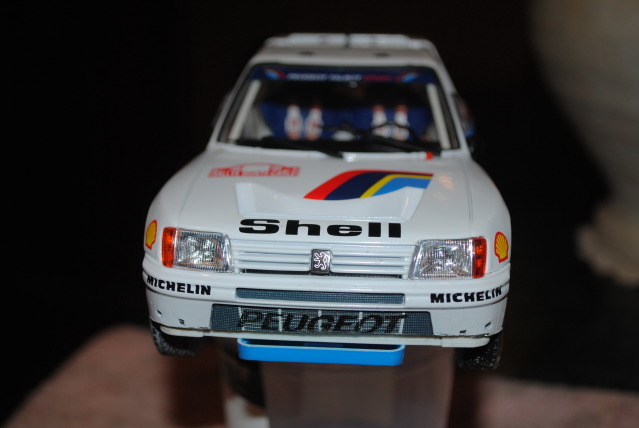 There is a great shot of the car at the finish podium in the book from the rally giants series by Graham Robsom - Peugeot 205 T16. Page 56. Further photos on pgs 82 & 83. 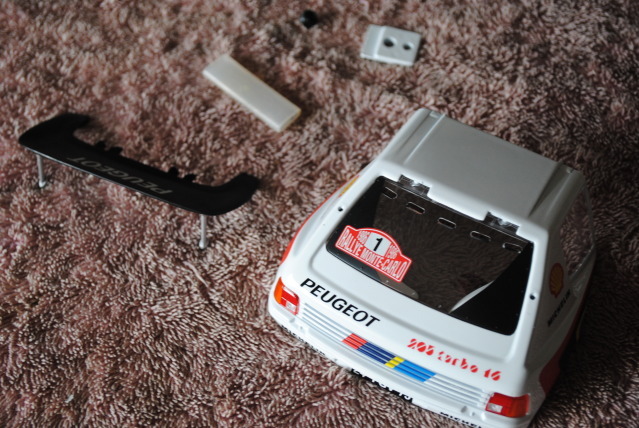 If you stuff up, you can always make the car look like the car after his massive accident in Argentina. ah thanks v much mal, that explains things, imagine thinking that ari would damage a car, tut-tut!!! gonna be a job trying to find something near that spoiler, to adapt/cut/butcher.........lol!! guess there's no going back now lol!! Will you need to cut that blue bit away? thanks col, prob not m8 as i need to attach a deeper front apron, which will cover it, but not stick out in front like the std one....hopefully anyway!! lol! 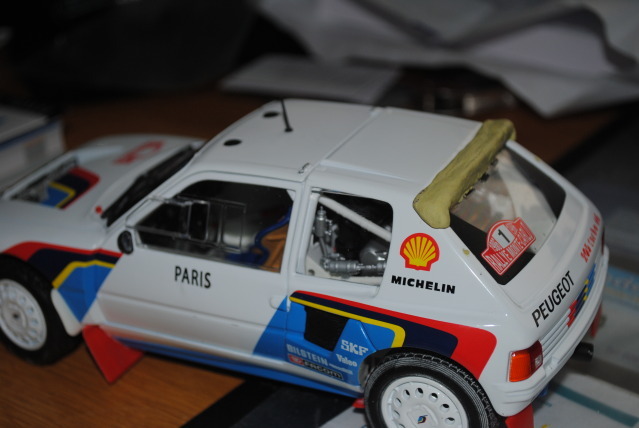 bmd wrote: thanks col, prob not m8 as i need to attach a deeper front apron, which will cover it, but not stick out in front like the std one....hopefully anyway!! lol! You got big cahonies there Billy, respect to you - what's next - ice sculpting? ?